I broke my tooth on a piece of fruit and nut chocolate. Harvey was very sympathetic. Not. "Well you should have sucked the chocolate off first then you would have seen where the nuts were. Silly Mummy." Nuts I kind of expect to be tough enough to damage teeth but when I posted Harvey's quote on my Facebook page, I had a couple of other interesting foods that had broken their teeth. Grapes ~ seriously? A grape. 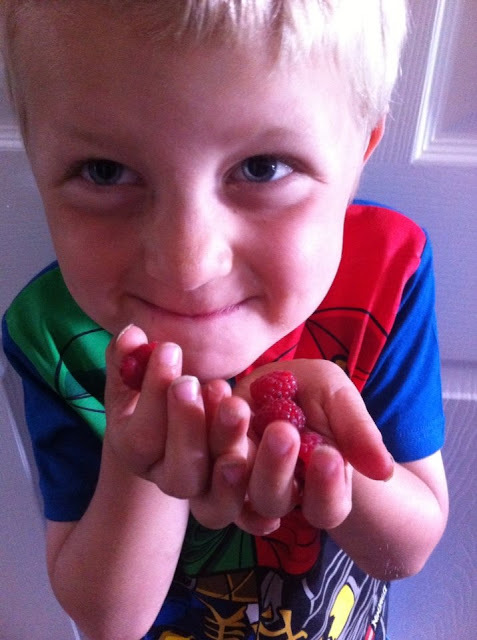 Harvey has just harvested his first batch of raspberries. They taste amazing! He has thoroughly enjoyed watching them grow. Let's hope they don't break another tooth though. I have heard how dangerous some fruit can be. Have you ever broken a tooth on something?